Professor Debra Bernhardt is internationally recognised for her contributions to the development of nonequilibrium statistical mechanics and thermodynamics including far-from-equilibrium fluids and confined fluids. 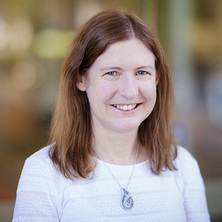 She is a Fellow of the Royal Australian Chemical Institute and Director of the AIBN Centre for Theoretical and Computational Molecular Science. Professor Bernhardt’s 20 years of research experience includes appointments at the University of Basel, Switzerland; the Australian National University; and Griffith University, where she was founding director of the Queensland Micro- and Nanotechnology Centre. Professor Bernhardt's research interests focus on the use of a range of theoretical and computational approaches to develop a fundamental understanding of the behaviour of matter, and application of these approaches to a wide range of problems including transport in nanopores, fluctuation phenomena, design of materials, gas separation, energy storage and conversion. Professor Bernhardt has held a research appointment at the University of Basel in Switzerland. She strong international collaborations with researchers at Politecnico di Torino, Italy; The University of Sheffield, UK; University of Leipzig, Germany; and École Normale Supérieure, France. Theoretical and computational molecular science: nonequilibrium systems, fluids and materials. Professor Bernhardt has played a lead role in the development of the statistical mechanics of nonequilibrium fluids including the fluctuation theorems, that lead to many results including the fact that transport coefﬁcients are positive. Predictions from the theories developed have been validated using nonequilibrium molecular dynamics simulations and experiment and the work has had international impact. For example, her work with the Evans and Sevick groups at the Australian National University resulted in the theoretical development of a fluctuation theorem that could be experimentally veriﬁed. This result was verified using computer simulations and experiment, providing the ﬁrst experimental veriﬁcation of any fluctuation theorem (Phys Rev Lett, 2002) which has been cited 374 times (Thomson ISI) and was listed by the American Institute of Physics as one of 19 notable physics developments in 2002. Since that time fluctuation theorems have become well established area of research and is applied in a wide range of fields. Evans, Denis James, Searles, Debra Joy and Williams, Stephen Rodney Fundamentals of Classical Statistical Thermodynamics: Dissipation, Relaxation, and Fluctuation Theorems. Weinheim, Germany: Wiley-VCH, 2016. Todd, B. D. and Searles, D. J. (2006) Simulation of Liquids. Chemical Modelling: Applications and Theory, Vol 4, 4 324-404. Travis, K. P., Searles, D. J. and Evans, D. J. (1998) Strain rate dependent properties of a simple fluid. Molecular Physics, 95 2: 195-202. Searles, D. J. and Evans, D. J. (1996) On the lifetimes of antisteady states. Australian Journal of Physics, 49 1: 39-49. Wang, F., Searles, D. J. and Vonnagyfelsobuki, E. I. (1992) SVD Analysis in Fitting Property Surfaces. Journal of the Chinese Chemical Society, 39 4: 339-341. Evans, Denis J., Searles, Debra J. and Williams, Stephen R. (2010). Fluctuation theorems and the relaxation to equilibrium. In: Abstracts of Papers of the American Chemical Society. *, *, (). *.